Okay, maybe not that kind of favorite things, but we asked some local native plant, bird and butterfly lovers, “What is your favorite native shrub or tree?” Here are some of their answers. . .
American Hazelnut (Corylus americana): Katy says she loves the Hazelnut because the flower is so pretty. She cautions however that finding a hazelnut is like finding a hundred dollar bill to a squirrel, so plant them only if you are open to welcoming squirrels to your yard. 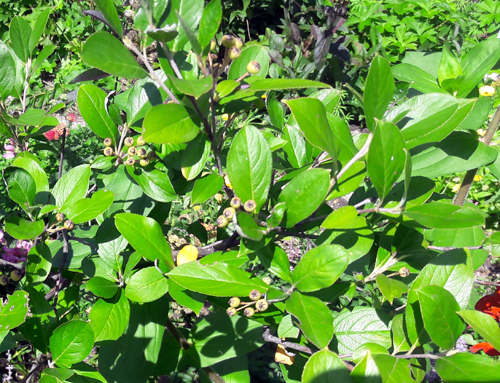 Black Chokeberry(Aronia melanocarpa): Chokeberry is the fruit that pemmican was made from. The indigenous people of North America invented pemmican as a high-energy food that could sustain a person on long journeys or throughout brutal winters. Katy likes Chokecherry because of the connection to the land and the traditions of the indigenous people. Buttonbush (Cephalanthus occidentalis): Katy recommends the buttonbush because when she was a butterfly monitor it was the plant that attracted the most fritillary butterflies: “I even saw a great spangled fritillary on a buttonbush one day.” They love the flowers and so does she. Elderberry (Sambucus nigra var. canadensis): Another one of Katy’s favorites is the Elderberry. “It’s just so giving,” she said as she showed me large bunches of elderberries. “I left some for the birds, but you should see all of the mead that I have inside.” Mead (according to Wikipedia) it is an alcoholic beverage created by fermenting honey with water and various fruits, spices, grains or hops. Share the love! Please tell us your favorite native shrub or tree, tell us what you like about it and send a photo. We’d love to add it to our web page. Together we can make the world a better place for birds, butterflies and other critters that we share our space with. The Native Shrub & Tree Sale continues until Sept. 22, with plant pick up on Sept. 29. Place orders here.